Want to take sharp low-light photos without the glare of a flash? How about capturing high-speed daytime action, such as your kid’s debut as a soccer goalie? By using your camera’s menus to increase the ISO setting, you can capture tricky shots such as these and expand your picture-taking options—but at a cost. Raising the ISO will also increase the amount of image noise —unsightly flecks that can make it look as if you took your picture during a digital snowstorm. Because image editors have trouble distinguishing these errant particles from legitimate image details, removing noise can be a challenge. 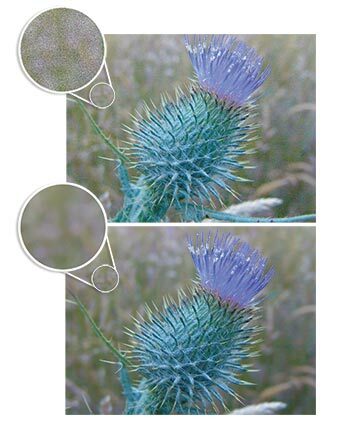 Both Adobe Photoshop Elements 3 ($90) and Photoshop CS2 ($599) provide a Reduce Noise filter that can minimize image noise. But getting the best results requires a deft touch. When you raise your camera’s ISO setting, you essentially make it more sensitive to light. This makes low-light photos easier to shoot because exposure times are shorter, decreasing the chance of blurring. By day, the faster shutter speeds help freeze action. To get these results, a digital camera amplifies the data that hits its sensor. But it’s like a radio: when you crank up the volume of a weak signal, the static gets louder, too. At moderate ISO settings, such as 200, noise tends to be subtle. But at high ISO speeds—400 or higher—the noise can be deafening. It’s especially noticeable in areas containing minimal detail, such as a blue sky, a smooth-cheeked baby, or blurred backgrounds (see “Prickly Problem”). Prickly Problem In this photo of a wild thistle, photographed at dusk at an ISO setting of 800, the out-of-focus areas surrounding the thistle are a cacophony of digital noise (top). After I applied a noise-reduction filter and a layer mask to restore lost detail, the background quieted down (bottom). Although the noise in every image is different, the steps for solving the problem are simi-lar in Photoshop CS2 and Photoshop Elements. Step 1 Open the noisy photo and make a copy of its background layer by pressing Command-J. Step 2 Select the duplicate layer in the Layers palette and choose Filter: Noise: Reduce Noise (see “Quiet Down”). In the Reduce Noise dialog box, drag the Strength slider to the right to increase the amount of noise reduction. As you do this, areas containing fine detail will begin to blur. To minimize the blurring, drag the Preserve Details slider to the right. Alternate between the two sliders until you’ve found a happy medium. Your goal is to reduce the noise where it’s most apparent without introducing obvious blurring in areas containing fine details. Step 3 Inexpensive digital cameras tend to produce chrominance noise, which can look like splotchy green or pink stains. If your photo also suffers from this type of noise, drag the Reduce Color Noise slider to the right until the color becomes less noticeable. Step 4 If you’re using Photoshop CS2, you’ll see a couple of additional options in the Reduce Noise dialog box. For example, you can use the Sharpen Details slider to restore some crispness to a photo. Click on the Advanced radio button, and you can isolate individual color channels (red, green, and blue) and apply different noise-reduction settings to each. Depending on your camera and the subject of your photo, you may find that most of the noise is in just one color channel. Quiet Down Photoshop CS2’s Reduce Noise filter lets you define just how much correction should be done. Step 5 When you’re done, click on OK. If you’re happy with the photo, you can stop here. In many cases, however, the Reduce Noise filter blurs areas containing fine details. With a little extra work, you can get the best of both worlds—sharp details and less noise. The trick is to selectively blend the filtered layer with the original layer beneath it. 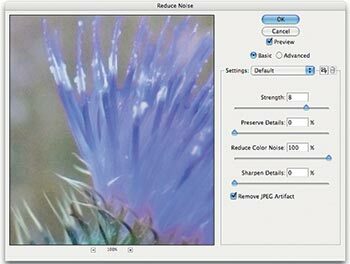 This technique lets you apply noise reduction only to an image’s most apparent noise. It also lets you be more aggressive when removing noise in the first place, since you’ll be able to restore detail lost in the process. For maximum control when blending layers, do what the pros do: use a layer mask on the filtered layer. Layer masks let you selectively hide a layer’s pixels (thus revealing the underlying layers) without actually erasing any data, so you can easily restore the pixels later. This approach lets you experiment without worrying about permanently altering your image. 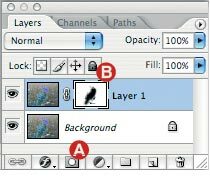 Step 1 To create a layer mask in Photoshop CS2, select the duplicate layer in the Layers palette and click on the Add Layer Mask button ( A ) at the bottom of the Layers palette (see “Behind the Mask”). Step 2 Click on the new layer mask ( B ) to select it. Behind the Mask Clicking on the Add Layer Mask button ( A ) attaches a layer mask ( B ) to your filtered layer. Painting on this layer with black reveals the underlying image. Step 3 Select the Brush tool from the Tools palette and choose an appropriate brush size from the Tool Options bar. Step 4 With your brush color set to black, paint over the areas where important detail was lost. As you paint, you’ll reveal the details in the underlying layer. If you go too far and uncover some of the original noise, switch the brush color to white (press the X key to do this quickly) and paint back over the area. This will return the pixels in the filtered layer to full opacity. Alternate between painting with black and white until you find the best blend of the two layers. Photoshop Elements doesn’t have a layer-mask feature, but you can simulate one by using a fill layer. Step 1 Go to Layer: New Fill Layer: Solid Color. Choose any color in the dialog box that appears. Then click on OK. Step 2 In the Layers palette, drag the new fill layer below the layer you want to mask—in this case, the duplicate layer with the Reduce Noise filter applied. Step 3 Select that duplicate layer and press Command-G; this groups it with the fill layer. At this point, the fill layer will act as a layer mask. As with layer masks in Photoshop CS2, you paint on it with black to reveal the underlying layer, or paint with white to hide it. When eliminating noise, remember that you’ll get more realistic-looking results if you apply noise reduction judiciously. Go overboard, and you’ll end up with artificial-looking images.